I don't have microwave oven, how if I use normal baking oven? What's the temperature and time setting? Or should I steam it instead? Thanks!! Is it a must to use unsalted butter? You might like to bake it in a pre-heated oven at 200C for about 15 minutes or so, depending on what size of your baking cup. can i use baking soda instead of "baking powder"? are they the same? 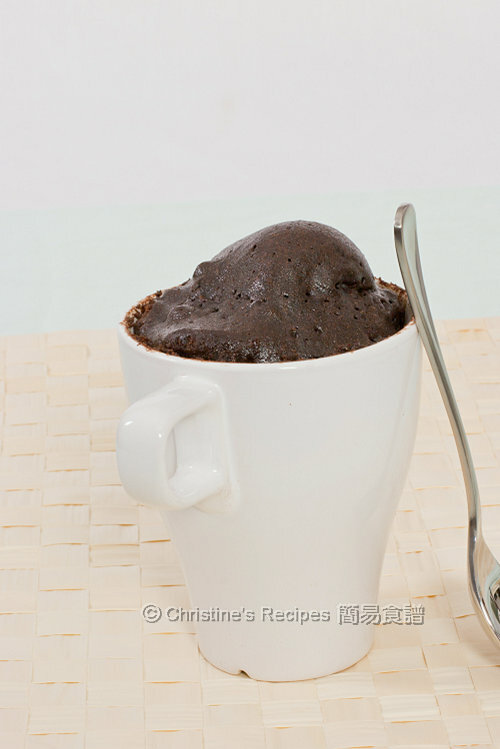 For making this mug cake, if you use chocolate, you could use baking soda instead. But if you use cocoa powder, mind you, some brands might be neutral and do not react with baking soda. So it's safe to use baking powder. 如果同一時間放兩杯係 microwave 度叮, 係咪都係 3 mins? 蛋糕的低筋麪粉代替 麪粉 (Plain Flour)? 效果是否沒有分別? Thanks Christine for the recipe! 真係好方便又好食! 我明明無落salt and I used the unsaltted butter! 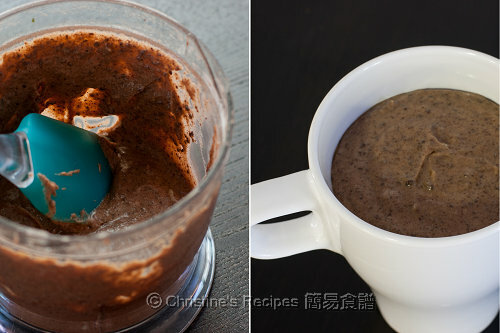 有一個問題好想問一問Christine的意見, 有一些蛋糕食譜有少量baking powder or baking soda, 可否省略? 其實是否蛋白打發得好其實不加也問題不大呢? 謝謝! I have tried your recipe twice but end up my cake still hard. I tried the second method (without adding in any baking powder).My microwave is 950w and i put in for 3 minutes. I didn't over beat it.I don't know what caused my cake become hard. I don't have a food processor, can I use a bullet blender? 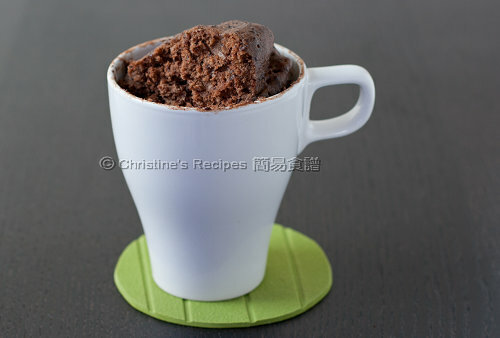 Christine, I love your recipes very much! I'm just a beginner. Your recipes are easy to follow and tasty! 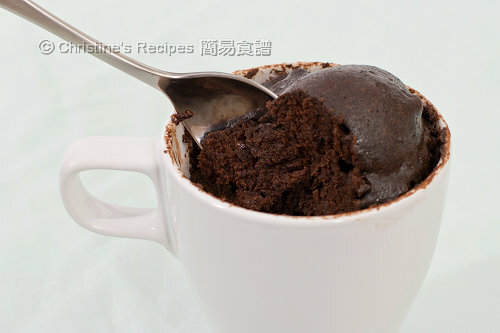 This choc cake is really great!! I don't have an oven and now can make cakes. Thank you very much! Btw, can I add some baileys? If so, i use the baileys to replace the amount of milk? I didn't try with baileys, but guess it works too. Christine, I tried again tonight. I used baileys instead of milk. I like the taste but then it's very dry. might need to add more baileys (than the original amount of milk) as it has alcohol? Could be. Add more to get the right thickness next time to see how it goes then.